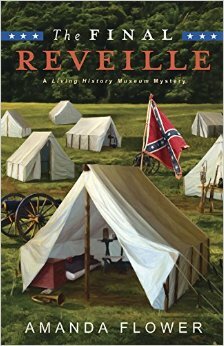 Cover Reveal: THE FINAL REVEILLE! I’m so excited to share the cover of the The Final Reveille with you! This is the first novel in The Living History Museum Mystery Series. It will release May 8, 2015! As the director of Barton Farm, a living history museum in Ohio, Kelsey Cambridge is underpaid and underappreciated, but she loves every minute of it. Determined to keep the struggling Farm open, she plans to impress the museum’s wealthy benefactress, Cynthia Cherry, with a four-day Civil War reenactment on the Farm’s grounds, complete with North and South encampments, full-scale battles, and an Abraham Lincoln lookalike spouting the Gettysburg Address to anyone who will listen. Unfortunately, the first shot in the battle isn’t from a period rifle but from Cynthia’s greedy nephew, Maxwell, who plans to close the Farm when he inherits his ill aunt’s wealth. On the first day of the reenactment, Cynthia and Maxwell stop by, and Kelsey and Maxwell have a public argument over the Farm’s funding. The next morning, things go from bad to worse for Kelsey when she discovers Maxwell dead in the brickmaker’s pit. Now Kelsey is the police’s number one suspect, and she must start her own investigation to save the museum . . . and herself while the War Between the States rages on around her. November 26th-December 25th, 2012, the authors of Killer Characters will be giving away one cozy mystery novel per day. It’s just our way of saying Happy Holidays and Thank You to all our wonderful readers and cozy mystery fans. My giveaway day will be December 2nd. Visit KillerCharacters.com for more information. And don’t forget the A Plain Scandal Goodreads Advanced Copy Giveaway is ongoing. Giveaway ends on December 13th. Visit Goodreads to enter.